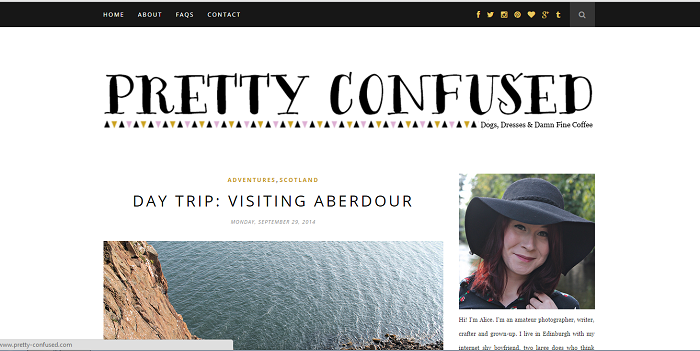 If you've clicked through to read this post then you can already see my brand new blog design. I was never 100% sold on my last design. Don't get me wrong, I didn't hate it, I just thought I could improve on it. I'm not going to claim I've hit the nail on the head this time, if you are a long time follower you will have seen more than a couple of incarnations of Pretty Confused. I am bloody pleased with how it turned out though - I got up this morning and the first thing I did was check to see if I loved it as much this morning as I did when I finally put it up last night. I totally did, I may even love it more than yesterday. I'm always interested in how people choose their designs and the process so I thought I would share mine. Here's a wee rundown of how the whole process went. There were loads of things I loved about this design, as I said. It's nice and clean with lots of white space which I think made the photos look amazing. I also did a couple of small customization on it such as my older and newer blog post buttons at the bottom and hacking the blogger template a bit which I was quite proud of. On the other hand there was also loads I thought could be improved upon - namely I wasn't 100% in love with the header and I really wanted a floating navigation bar at the top of the page. Looking back on it now I know this was probably the wrong way to do things, but seeing as my header was my primary reason for wanting to do a re-design I decided to start there. Over the course of a couple of months I came up with a bunch of different possibilities, some of which you can see below. I never felt like I was getting any closer to what I wanted though. Basically I got distracted from my vision. Some of these designs even had the full template ready before I realised that I didn't actually like it any better than I liked my old one. I didn't want to change everything around only to spend the next six months unhappy and spending loads more time that could have been spent, you know, actually blogging fiddling on Photoshop and trying to teach myself more CSS. Eventually I decided to go about it another way. For all my previous design I have used my own knowledge of HTML and CSS to hack the blogger basic template. For someone who had zero experience with web design before I started blogging I think I did pretty well getting this far but I'd reached the point where I wanted something a bit more sophisticated. I thought long and hard about buying a template but I wasn't keen on having the same design as someone else and I couldn't afford a designer to make one just for me (I also have a suspicion that my indecisive nature would make me the worst client ever). I settled on finding a free template that I could customize myself. I'm not going to lie, it took me many, many, many hours of trawling Google and Pinterest for me to find the right one. But in the end, I found it. This template was free from THEMEXPOSE and has a whole bunch of nifty little bits and pieces like the floating header and author bio in my posts built in. You can get it for free if you keep an attribution at the bottom of the page (which is the option I chose) or pay $5 to use it without the attribution and access their support service. Now that I had the bones of the blog down it was a lot easier to look at what I needed from a header. At first I thought I wanted something stretched across the whole of the top of the blog (like the Maiedae site has) but my idea for a brightly coloured floral look didn't exactly pan out how I wanted it to. Although I do love the set the free set of florals from FreePik I used. I loved it, and I still really like it but it just isn't me. The one thing I had liked about my previous header was that it was simple but recognisable, so I went back to that idea. What I ended up with is simple but lovely. To make it all go together seamlessly I included the same gold colour into the header as the one in the template. I also kept my tagline 'dogs, dresses & damn fine coffee' which I think has stuck with me through a couple of re-designs now. What can I say? Twin Peaks today, tomorrow, always. The font is gorgeous and I made me own brush on Photoshop for the triangle underline. After that it was just a case of making a few changes to the CSS and HTML and I had something I was really happy with. This feels so much more me. It does pretty much everything I could ever hope for. It's a lovely, clean, modern look. Definitely nothing groundbreaking, I can think of more than a few other blogs that have a similar feel. I'm okay with that though, it's neat and most importantly it feels like it reflects me so much better. It's already inspired me to update the look of my social media and I've also updated my about me page for the first time in over a year so it's doing it's job. I hope you guys love it as much as I do. There are still a couple of small changes I'll make as I get used to using it, but I'm hoping that design is going to stick with me for a long time. What do you guys think? After all, you'll probably see it more than me! I love the new look :) I've changed my layout so many times and never been 100% happy. I get so frustrated everytime I try and use photoshop! it's looking good! I'm due a redesign myself, i think!